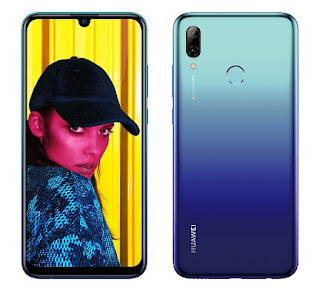 It is a bit difficult to get a smartphone that offers a fairly solid spec sheet when you are on a budget Huawei’s answer to that is the Huawei P Smart (2019) smartphone which offers an array of features for an average user at an affordable price. Carrying over the dewdrop notch Huawei featured in a number of it releases last year, the smartphone does look good at its price. Let’s go on so that you can decide if Huawei actually made the balance between affordability and value on this smartphone. Bringing on a nicely shaped smartphone with a 19.5:9 aspect ratio that makes it a bit slim and svelte too. A rather common sight for a smartphone of this age, the Huawei P Smart (2019) comes with a glossy plastic casing. The finish makes it prone to dirt and becomes a fingerprint magnet in little time of handling. Otherwise, handling the smartphone is easy with its thickness of 8mm and just weighing 160g. There is the two circular cameras at the back and a fingerprint sensor, an audio jack at the bottom with MicroUSB port and other regular features. Over to the front of the smartphone is a large display with the usual bezel reduction that ends up leaving a bit of bezel left at the bottom. There is the notch talked about at the top and it can be hidden with black bars showing on the screen on both sides of the notch. The display takes up 6.21-inch of space and comes with a FHD+/resolution. The smartphone fulfils the criteria of being able to go a day without having to plug it in. Going a bit above the mediocre line, the battery has a 3, 400mAh capacity. A fair quota of power for your daily use and with it comes quick charge to refill your battery. However, it is a bit disappointing that the smartphone still comes with a MicroUSB port rather than the modern day USB Type-C.. This smartphone does well to feature a camera that can deliver even if the quality is not top notch.You can still manage to get a social media worthy quality. There is AI scene recognition ‘HiVision’ for object identification/shopping and text interpretation amidst other nice features. The 8MP front camera is equipped with AI beauty for better-looking selfies and it works for face unlock too. The rear cameras includes a 13MP main sensor and a 2MP secondary camera. Huawei sources the chipset on this smartphone from within, meaning it has its own HiSilicon cores on it. The HiSilicon Kirin 710 processor works smoothly running multi-tasking well with 3GB RAM to muster. There is a turbo boost to improve gaming and a 64GB storage space or 32GB space for storing files. Storage expansion can happen up to 256GB with a memory stick and there is Android 9 with EMUI 9 on top. The smartphone is available for about 60, 000 Naira depending on the deal and your location.